In the 2018 Nissan Maxima, you can put all the information you need in clear view. 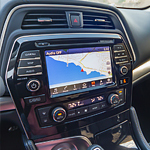 The popular luxury sports sedan is available with a Drive-Assist Display installed right in front of the driver's seat. This system includes a vibrant 7-inch color display. It's located in the center of the two gauges. This screen can be customized to display information that's most important to you. It can show you performance metrics, tire pressure, trip data, and more. You can even set it to display directions from the navigation system or the name of the song you're currently listening to. Changing screens is easy thanks to the controls built right into the steering wheel. Want to learn more about the 2018 Nissan Maxima? We invite you to stop by Lithia Nissan of Ames today. We'll show you how it works and let you experience it for yourself on a test drive.